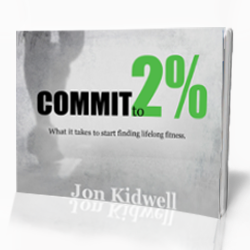 Jon Kidwell Fitness: What's That in Your Shopping Cart?? What's That in Your Shopping Cart?? 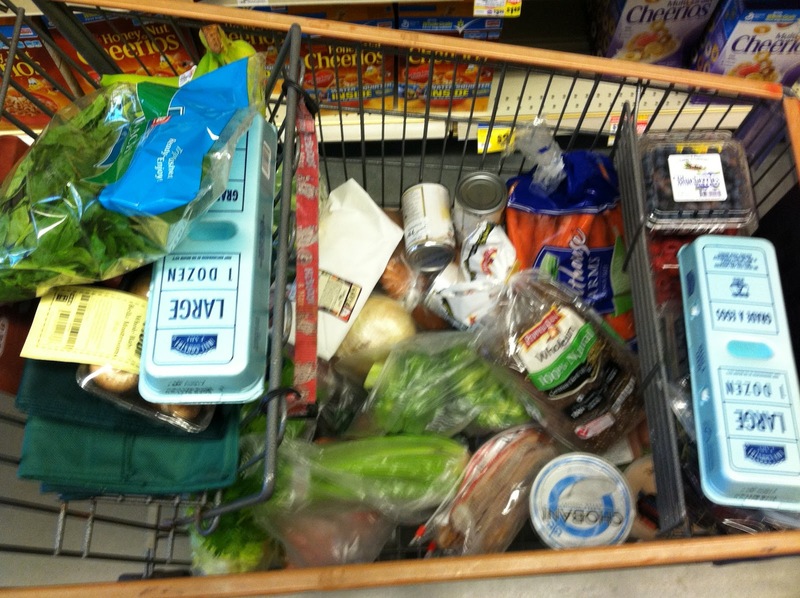 Have you ever looked around at other people's grocery cart? I do all the time. I am intrigued to see what other people are buying. Apparently I am not the only one. 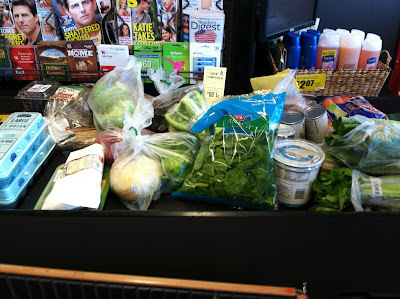 Tons of people have been asking me what I eat and what I buy at the grocery store. On a recent trip to the store I took pictures and wrote down what was on my receipt. Here's what I got. I apologize for the shaky-ness. They don't allow pictures in the grocery store, so I had to be covert. 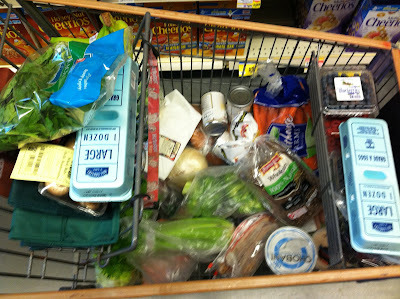 I pack my cart with produce. I buy a higher percentage of produce (fruits and vegetables) than any other food category. Fruits and vegetables are handy for snacking and adding as sides to any meal. The old adage of 2-3 fruits and 3-5 vegetables a day is something I live by. This is my second highest category. Protein is so important for your body when you exercise. It aids in building muscle, muscle repair, and recovery. Protein is staple in every meal in every meal I eat. It makes you feel full for a longer period of time. Definitely a bonus. We all know I love dairy. I made that very clear in a previous post. Dairy helps build muscles, strengthen your bones, and tastes so delicious! Like dairy, there is a lot of negativity about carbohydrates in the news these days. "Carbohydrates make you gain weight", a paraphrase from Gary Taubes author of Why We Get Fat. I actually really enjoyed the book despite this claim. It made me think about what I eat and how it effects my body, but I disagree with the gross abandonment of carbs in my diet. Carbohydrates give you energy. Some carbs (refined, think white bread) give you energy quickly while whole grains, more complex carbohydrates, take longer to break down and give you energy over a longer period of time. I believe in buying more complex carbohydrates and eating them in moderation. Keep sneaking peeks at other people's carts or asking me what I am buying. I am more than happy to share and if you see something I am missing, but should be eating, let me know. Sneaky pic #2 at checkout- Is he texting or snapping pics? Who knows? I have actually been watching a lot of documentaries on food and eating habits. Have you seen fat sick and almost dead? Forks over Knives? both of these made me change a lot of how I eat and shop. I saw Fat, Sick, and Nearly Dead and thought it was a really powerful documentary. I don't fully agree with the "juice plan", but it seemed to work well for him and I like the message of health. I need to watch those other two; I've heard about them.